James Cook University and the Townsville Fire have announced an exciting new partnership that will boost women’s sport in north Queensland. Under the agreement, the club will now be known as the JCU Townsville Fire. JCU Vice Chancellor, Professor Sandra Harding said it’s an exciting announcement for elite women’s sport in northern Australia and expands JCU’s existing support for the club. “This partnership is another example of JCU giving back to the community. We are proud to be supporting women’s sport in our region. At the same time, the partnership will boost JCU’s national exposure,” Professor Harding said. 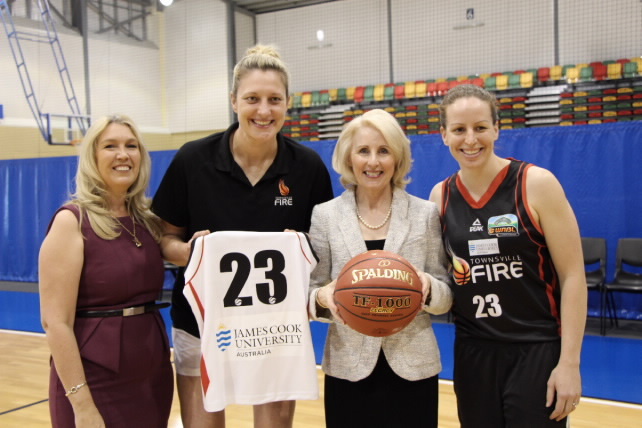 The chair of JCU Townsville Fire, Jayne Arlett said the club was delighted to unveil JCU as their Principal Partner for the next three seasons. “The Townsville Fire is one of the nation’s pre-eminent women’s sporting clubs and we are excited to be partnering with JCU for the next three seasons,” Ms Arlett said. “In recent years, the club has developed a world-class program on the court and we look forward to partnering with JCU to provide a similar environment for our players off the court. The JCU Townsville Fire is the only female professional sporting team of any code in Northern Australia. JCU firmly supports the team’s focus on providing strong healthy role models for girls and women. “We believe both organisations can work together to provide leadership for girls to help lift their aspirations. There is so much to be gained from linking elite sport to educational success,” Professor Harding said. Under the partnership, JCU will offer scholarships to a number of players who wish to undertake tertiary study. Last year JCU joined the National Network of Elite Athlete Friendly Universities, which provides support for athletes to help balance sport and study. Professor Harding said it’s crucial that athletes be able to combine their sporting and academic aspirations. “We want to help the players from the JCU Townsville Fire reach their full potential so they can boost their prospects once they retire from professional sport”. JCU and the Fire are also looking at options for the University’s students to undertake work placements at the club’s Townsville base. JCU already provides support to the North Queensland Cowboys, and the Cairns’ teams the Northern Pride and the JCU Mariners. The JCU Townsville Fire has excelled in the WNBL in recent years. The team has played in the finals in the past three seasons, and in the past two grand finals. The Fire’s 10-player team boasts five international players, three of whom have competed at the Olympics.